The ability to interface patient monitors directly to a computer, and generate a clinical record has existed for over 20 years. However, the acceptance of comprehensive electronic medical records in anesthesia has been slow to develop. Experts anticipate this reluctance is changing because of enhanced patient care through the use of detailed health information record systems. Anesthesia Informatics provides the health informatician and administrator with a comprehensive overview of this blossoming technology. With contributions from leaders in the field, this user-friendly guide addresses how this technology has enhanced both the need for and the ability to collect and apply data in an acute care setting. It also offers invaluable insight on the business implications and the rationales required to make a purchase decision. Each section outlines need to know information to help the reader with the implementation and utilization of an Anesthesia Information Management System. Useful case scenarios focus on the ideal components (anesthesia record, business rationale, communication, collaboration, and training) of a fully automated record-keeping system. Illustrations note 24 Illustrations, color; 45 Illustrations, black and white; XXVIII, 504 p. 69 illus., 24 illus. in color. Anesthesia Information Management Systems (AIMS) have been in existence for several decades, but their use in clinical practice has been very limited until recently. When initially developed, AIMS were primarily focused on replacing paper records with an electronic form. In parallel, the healthcare industry has recognized that electronic medical records are a key element of improving patient safety and reducing error, with many insurers actively encouraging implementation of electronic medical records. Therefore, interest in adopting AIMS technology is growing within the anesthesia community and this book represents a comprehensive handbook in setting up such a system. Anesthesia Informatics uses a case-based approach to review the subject in a practical manner and is written with the practicing physician in mind. Therefore, it will help anesthesiologists, anesthesia departments, and hospitals in purchasing the ideal technology for their unique situations and help them to utilize it for the ultimate goal of improving patient safety and health-system efficiency. 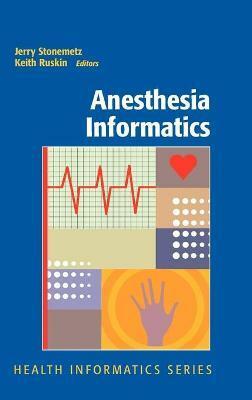 The goal of the Editors was to make Anesthesia Informatics readable by a clinician with a problem to solve. Each of the international panel of contributors is an expert on their topic within the book, ensuring highly detailed, academically rigorous chapters. Each contributor is active in using the clinical systems discussed in this book, giving them real-world experience as well as expertise in the theoretical aspects of medical informatics. The Anesthesia Information Management System.- Rationale for Purchasing an AIMS.- The Vendor-Customer Relationship.- Request for Information/Request for Proposals.- Implementation of an AIMS.- Ensuring Usability through Human Factors Engineering.- Data Standards.- Device Interfaces.- Architecture.- Preoperative Systems.- Intraoperative Charting Requirements.- Medication Management.- Legal Aspects of AIMS.- Case Study: Implementation of an AIMS at an Academic Medical Center.- Automated Charge Capture.- Decision Support.- Perioperative Process Improvement.- Components of an ORMS.- Operating Room Management System.- Integration of ORMS and AIMS.- Operating Room Scheduling and Capacity Planning.- Mobile Computing, Education, and Simulation.- Information Technology in Anesthesia Education.- Handheld Devices.- Wireless Technologies.- Security of Health Information.- Simulation-Based Learning as an Educational Tool.- Future Implications of Simulation in Anesthesia.